Hagia Sophia used to be the largest church among the Christians in Istanbul, Turkey, until the building was converted into a mosque in 1453 when Constantinople was conquered by Sultan Mehmet and army Ottomen. 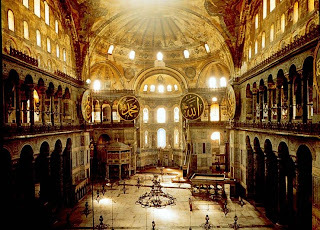 Then in 1935 to the present Hagia Sophia became a museum in Istanbul known as the Ayasofya Museum. Hagia Sophia is one of main Turkey tourist attractions. 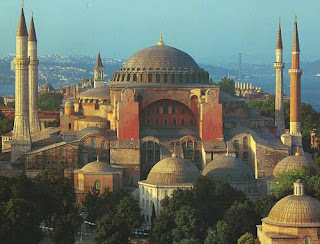 Hagia Sophia, the building is often used as a reference model for several other mosques, including the Blue Mosque which is located in front of him. During the transformation into a mosque, all the elements of Christianity such as altars, bells, and statues removed. Then the interior design modified and adapted to the characteristics of Islam. Later added two minarets. Do not forget the mihrab (the priest standing), the pulpit, and also where ablutions. There is calligraphy that adorn the dome of the mosque since the 19th century. Until now still be found. At the top there is a museum gallery where there are works of art depicting Christian religious teachings. Located directly below the room nuances of Islamic art and also functioned as a mosque. Although it has been converted into a museum, the Muslim religious activity is carried out. Efforts to repair the building makes this museum has an element of balance will be two religious styles. In addition Hagia Sophia in Istanbul, Also visit nearby places such as Blue Mosque, Topkapi Palace, Basilica Cistern, Hippodrome, Istanbul Archaeological Museums, Turkish and Islamic Arts Museum Gulhane Park.